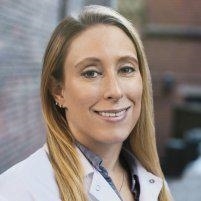 Aimee Kraft DDS is a general dentist treating patients in the Brooklyn Heights neighborhood of New York City and the surrounding area. With more than 10 years of experience in the field, she utilizes safe, state-of-the-art technology to give her patients the best results. Dr. Kraft offers many of the most advanced treatments available, including Invisalign® orthodontic treatment, dental implant restorations, and complex tooth extractions. She also offers standard general dentistry services, including teeth whitening, dentures, veneers, simple tooth extractions, fillings, and emergency care. Before attending dental school, Dr. Kraft received an undergraduate degree from the University of Michigan. She went on to study at the State University at Buffalo’s School of Dental Medicine. After earning her degree, Dr. Kraft completed a general practice residency at Long Island College Hospital. She also spent several years working at the United Cerebral Palsy, Brooklyn Campus. Dr. Kraft is a member of the New York State Dental Association and the American Dental Association. She is currently welcoming new patients at her practice, Aimee Kraft DDS. To make an appointment with Dr. Kraft, please contact the office or use her convenient online scheduling tool today. Out of nowhere, I started to have a throbbing pain in my mouth. I set up an appointment with Dr. Kraft on line on the weekend for Monday. It was confirmed first thing in the morning. Dr. Kraft had xrays takenwhich showed that there could be a crack in my tooth below my filling. (Probably fifteeen years old or more.) She was very patient and gave me numerous shots till I was totally numb. She found that there was a crack below the filling, began a root canal, and helped connect me with an orthodontist to complete the work. I am set up for the root canal and crown Thursday. Quick, efficient, reasonable, and common sense dentistry at its' best.